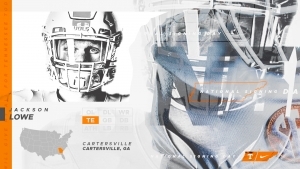 Josh Ward’s Analysis: Lowe already has good size at the tight end position, which should improve even more after he enrolls at Tennessee in the spring. The Vols rely on their tight ends both in the passing game and as blockers. Lowe will help with that greatly. 2018 Georgia Preseason Class 4A All-State selection. 2017 All-Region 5-AAAA first-team selection. Helped lead Cartersville to a 14-1 record and an appearance in the state championship game in 2018. Starred at Cartersville High School in Cartersville, Ga.
Tallied 340 receiving yards and six touchdowns as a junior in 2017. As a senior, earned player of the week honors from the Daily Tribune News in Cartersville, Ga. for performance in the second round of the playoffs where he had five receptions for 74 yards and three touchdowns, including one score on fourth-and-10.